edit – Well somehow I missed that DLD has branched off to its own website, http://www.darklordday.com/. So the Internet confirms that it was this past weekend. The last Saturday in April is traditionally known as DarkLord Day. This is because the release date for and all sales of DarkLord occur on this day. 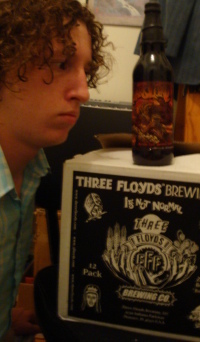 I was informed that TODAY is the last Saturday in April, so I have to assume that today is DarkLord Day, though you’d never know by visiting the Three Floyds Brewery website – it hasn’t been updated in over a year. Well, as I couldn’t make it to Munster, I decided to open up a bottle of last year’s vintage. DarkLord is a Russian imperial stout. This style classification does for stout what imperial IPA does for India pale ale: turns it up to eleven. More properly, it did for stout what India pale ale did for pale ale: gave the beer the legs needed to handle a long voyage out of England, this time to the court of Catherine the Great. As with all historically bigger styles craft brewers have taken it to an extreme. DarkLord, for instance, is around 13 percent alcohol, though you’d hardly notice it for all the flavor they have packed in there. 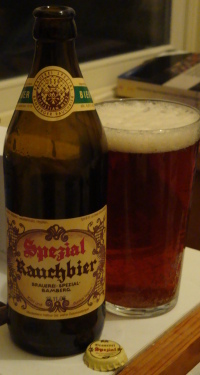 A big beer like this you must treat as you would a bottle of fine wine. Don’t drink it cold as you will lose all the flavor. Slightly chilled is best, at what we call ‘cellar temperature’. Pour yourself a snifter then give it a few minutes to breathe. Swirl it and appreciate the coating the beer leaves on the glass. DarkLord is nearly pitch black. Only a bit of caramel brown is visible around the few bubbles. The hint of sienna head that forms when pouring quickly dissipates. While carbonated, it is not too effervescent and the syrupy thickness does not abide head. The nose is rich with roast malt character: dark Columbian coffee is most prominent, mixing with the aroma of bitter chocolate, toffee, caramel, as well as a fruitiness of prunes and raisins. A beer like this I could sit here and smell all day. It’s been about a half hour so far and I’ve yet to take a sip. But in the name of journalism I must proceed. As always my first reaction is surprise at how mild it is despite intense flavor. That’s the paradox of the DarkLord: full of woe and fury but never releasing too much at any one time. The flavor as well is dominated by the roast malt. Coffee stands out at first, accompanied by chocolate, milk, dark, and bitter. The fruit note is perhaps more clear on the taste, with raisins, dates, prunes, and black caps. The Lord is a fountain of flavor: caramel, toast, toffee, vanilla, coffee, roast, maybe even a hint of bourbon (though I know there’s none in there). One thing melds into another on this diabolical ride. Very thick and somewhat sweet, yet light-years from cloying. This beer is simply fantastic. Here is I Am A Craft Brewer, a short video made by Greg Koch from Stone Brewing. It is a heartfelt tribute to the American craft brewing industry (with a nod to the international movement), toasting the creativity, passion, and camaraderie of craft brewers. It was first shown to the brewers at this year’s Craft Brewers’ Conference, which ended today. Researchers at Boston University deserve some sort of award. They have perfected control over flocculation, the process wherein the yeast cells clump together and fall to the bottom of the fermenter. By varying when (and if) the yeast flocculates you can exercise precise control over the flavor of the beer. If the yeast clumps together early and falls to the bottom it may leave a good amount of residual sugar in the beer and give it a sweet taste. On the other hand, if it fails to flocculate at all the beer will remain hazy and have a bready yeast flavor. Anyway, James Collins led a team of synthetic biology researchers that have developed a kind of library of genetic “routines”. They have deconstructed much of the biological machinery that drives activation of genes. By using this library and lots of computer modeling they are able to assemble these component parts into what they call a gene network and have them behave in predictable ways. So anyway, this team has used their library to produce a system quite analogous to an electric circuit that precisely controls the timing of yeast flocculation. I wonder if anyone could get away with synthetic-yeast fermented beer?